Because Carrabelle is located at the eastern end of the Florida Panhandle, it’s an ideal stop whether going or coming across the Gulf or around the Big Bend. 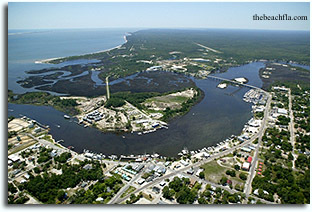 The Carrabelle River is a deep water river that provides a natural protection for visiting cruisers. Carrabelle is known as a fishing town, but the people who visit remember the people as friendly and the town as comfortable. They remember a conveniently-located grocery, a well stocked hardware store, nice restaurants and a real ice cream shop! Also located downtown, within walking distance of the marina, is the world’s smallest Police Station and the Camp Gordon Johnston Museum. During World War II, Camp Gordon Johnston (located near Carrabelle) trained over 250,000 amphibian troops.